When I was a preschool teacher we had a sharing box. 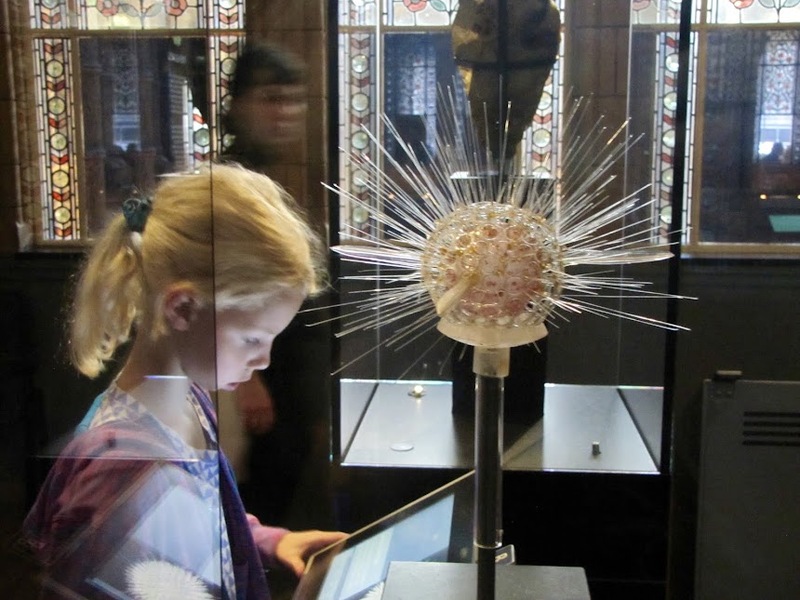 There were six categories of things that a child could bring to school and share. Things You Made, Mechanical or Scientific Objects, Good Books, Music and Games, Photos or Articles, and Things from Nature. One morning a child brought a slightly rusted truck. He stood examining the categories, each which had photos of examples to guide him in correctly classifying his sharing. After awhile he placed his truck in the category of Things from Nature. Curious what prompted his decision, we waited until Sharing Time and when we asked for those sharings of Things from Nature, he popped up and grabbed his truck. "I found this out in nature," he began, "out in my backyard." 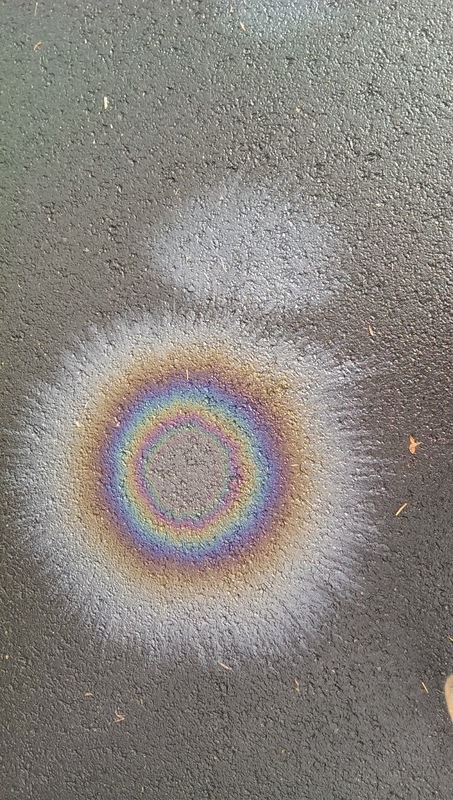 I too found this oil slick out in nature just down the street in my neighborhood. I can see how a child could construe something found outside as being part of his natural world. 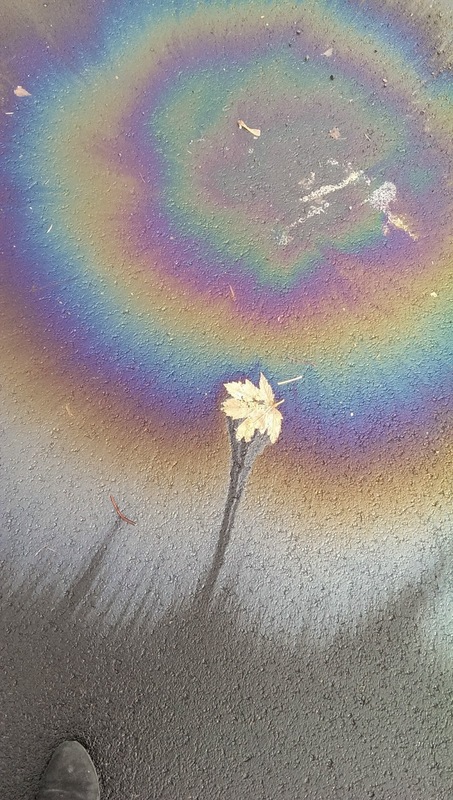 The glory of this blooming iridescent oil slick was enhanced by a single leaf, all of it basking in the sun shining through the fog. I hesitated glorifying a toxic spill of oil, but the glow was irresistible. Oil is found in nature, out under the sea, in the valleys of Wyoming, Texas, Arkansas and under the Alaskan tundra. Why quibble about oil? It is so natural. The physics of how oil and water mixes or the phenomena of how the light spectrum makes circles of color in an oil spill are irrefutable laws of matter. Why quibble about oil? It is so natural. I too once found a truck out in nature, in my backyard streambed. It's gray steel body almost indistinguishable from the basalt rocks all around it. I was cleaning out the stream, an annual event. I gathered the snagged branches, cut back the thorny blackberries that stretched across the stream snagging leaves and trash, and pulled out the yellow invasive water lilies. The truck was an old one, parts of it gone. It had been in the stream a long time. It's body made of heavy metal, not like the ones you purchase today, dating it. It didn't belong in the stream. Oil too doesn't always belong. But sometimes it does. If there were a sharing box for oil it would help classify the complicated politics surrounding its existence in our backyard. Oil Found in Nature, Oil Heating My Home, Oil Leaking from Pipelines, Oil Running My Car, Oil Killing Fish and Birds, and Oil Prices Affecting Our Economy. Oil in our backyard is a complicated thing, a natural by product of our inventive and modern world. More oil found in nature. An oil snowman with a iridescent heart. I need another category. Oil Snowmen.